A handsome duke. His beautiful soon-to-be duchess. A whirlwind courtship. It is this author’s privilege to report on the event all of London is talking about: the upcoming wedding of the Duke of Hamilton and Brandon to the only daughter of the Duke of Richmond. Every detail of the “Wedding of the Year” will be reported in these pages as a London Weekly exclusive. But I, Miss Sophie Harlow, must confess to a secret infatuation with this “double duke” that can only lead to trouble. It is impossible that this notoriously upstanding gentleman would ever jilt his bride for a scandalous female newspaper writer. And yet . . . the arrival of a foreign prince, the discovery of a shocking secret, and one passionate kiss could change everything. Will this perfect duke risk the scandal of the year to marry the woman his heart desires? Lord Simon Roxbury is a godsend to gossip columnists everywhere. This notorious rake has recently been caught in an extremely compromising position by none other than The London Weekly‘s Lady of Distinction. Rumor also has it that Lord R received an ultimatum: be wed or be penniless. 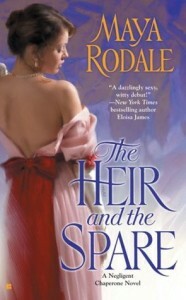 As A Lady of Distinction, Lady Julianna Somerset typically reports on other people’s scandals, but soon she finds herself embroiled in a very public battle with an irate Lord Roxbury—one that leaves her reputation in tatters and her position at The Weekly on the line. With no other choice available, these two enemies unite in a marriage of convenience to rescue both their reputations and secure his fortune. With their rivals intent on revealing the charade, Lady Julianna and Lord Simon inevitably surrender to temptation. It may just be a love match after all . . .
Maya Rodale’s wonderfully witty Writing Girls series is a winner! Her third delectable love story to feature a plucky Regency heroine with a pen, The Tattooed Duke follows a scandal sheet reporter posing as a common housemaid in order to uncover whatever nasty little skeletons an adventure-seeking Duke may be hiding in his closets—only to fall in passionate love with the nobleman whose secrets she’s been exposing to the world! The Tattooed Duke is deliciously fun historical romance fiction in the vein of Laura Lee Guhrke and Suzanne Enoch, and no true romance fan will want to write it off! One of the freshest and most exciting voices in the new generation of historical romance writers, the delightful Maya Rodale concludes her Writing Girls quartet with Seducing Mr. Knightly. This witty and wonderful Regency romp features a plucky young heroine—the advice columnist Dear Annabelle, writing for The London Weekly—who, following the advice of her own readers, sets out to capture the heart of her handsome employer by any means necessary. Do you love the charming and captivating romance novels of Elizabeth Boyle, Laura Lee Guhrke, and Suzanne Enoch? Then Seducing Mr. Knightly should be most definitely on your agenda! In London, under the not-so-watchful eye of her chaperone, newly-arrived American Emilia Highhart is unknowingly courted by twins-and only one of them is the love of her life.